We developed vysen for enterprises, on popular demand based on accuracy, and scalability of the platform we are releasing multiple tiers of product usage. We believe this level of accuracy should be accessible to everyone. 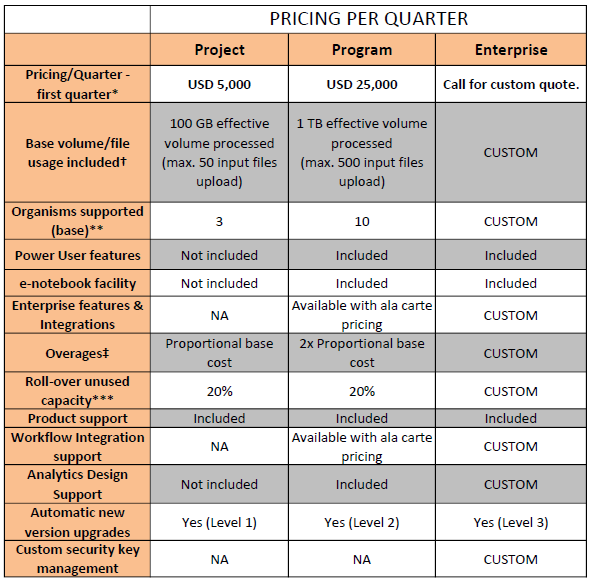 Below is the introductory pricing tiers besides the free tier mentioned in vysen and About pages. Learn about the origin of our name - ReSurfX. Effective Processing Volume (EPV) = 1/20 uploads + 1/20 downloads + volume processed through the different modules (all in file sizes). Are my data and outcomes in paid tier confidential, or does ReSurfX team or anyone else access them? Yes, ReSurfX is structured to maintain the privacy of customer data through many levels of security and access control and records both to protect from external threats and has strong internal controls as well. The typical access of your data is for our product to process them through our application as you request through the user interface or explicit access permission you give during request for service (if it is needed). Most other maintenance are done through automated scripts to prevent direct access even by our team. We have end-to-end encryption and many other layers of control. These security controls at multiple levels are designed in the infrastructure by highly qualified IT experts. Does ReSurfX team or product do any quality control on data from our account? ReSurfX team does not do any quality control on your input data, though the product has internal quality metrics that sometimes trigger an automated message. Many of the files used in our analysis will be large sized input files, how does vysen handle this? ReSurfX has integrated a high-fidelity and rapid transfer product from an IBM company (Aspera) for large volume data transfers. Free trial is a full featured product, except it is limited by capacity for user to upload data and by total volume that can be processed. In that case limited data from MAQC and SEQC studies [ref] are provided in the product. The data provided is sufficient to test the value and features of the product. Can we have other forms of trials or evaluations? Yes, you can ask for other forms of evaluations – these will be called pilots. We have designed the best scheme that works based on experience with many other customers. We can discuss your needs and determine pricing for those forms of pilots. Why do we find another aesthetic product with a very similar name as your company on internet searches and in some social media? Our company ReSurfX is built ground up with novelty and uniqueness in components used to provide value to our customers – that novelty extends to the name of our company. Our IP is well protected by multiple means including many patents across the world. This other company copying and using our novel name for a different class of product (shame on them, we wonder how their product will be). Though that does not affect the value we provide your team and organization, our legal team will be handling that situation. How does inclusion of an organism annotation file in format suited to be used with vysen work? ReSurfX::vysen team continuously add common organism annotations for use with our product. That is one reason we often ask our customers when they sign up for product subscription. Tiers that have limits can get access to additional organism annotations to use with vysen (subject to certain restrictions on processing) at additional cost. 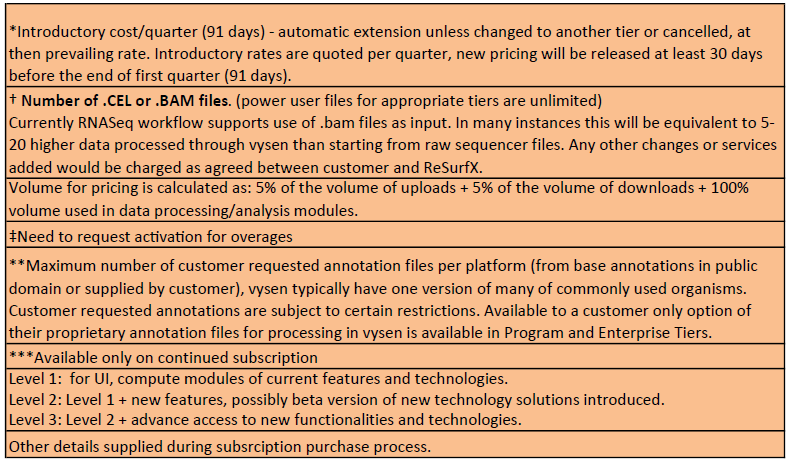 When there is 'No Limit' in a Tier if the organism is not supported in the version of the product, ReSurfX::vysen team will make every effort to include the organism support requested by the customer (subject to certain restrictions on processing) - in these cases the customer is solely responsible for not violating any legal limitations on using those files. Can I get custom annotations made available to my account (or for our team) only? Yes, though in some cases we may need to charge an appropriate price proportional to technical effort involved. When there are multiple limits on a tier (e.g., volume vs. number of files), how does it work? When there are multiple options on a limit, first limit reached will be the one to be used in product category. If I am willing to pay overages will my account continue to work when I cross the threshold? Usually if the product is in the middle of processing the process will complete (unless it is in violation of another logic imposed) and the user will be unable to view, process or download more. User will have to contact our team reaffirming that they are willing to pay overages at rates applicable to their subscription Tier before our team will activate the ability for the user to continue using the product. Are there additional limits on daily data processing that is not explicitly listed in pricing chart? In the Project & Program tiers daily data processing limit might apply. Can I cancel the product after I sign-up and start using? We do not allow cancellations that might trigger prorated reimbursements in most instances, as we would have incurred expenses in setting up processing capability for you. Does ReSurfX::vysen do any quality control on user supplied files? For customer supplied files, they are responsible for quality control. Our product does have some automated triggers that might help you recognize some problems with your data quality. Sometimes anonymized performance indices might help our team recognize problems – in those cases they are instructed to be helpful to our customers. At this time it is a trial feature and we would recommend not relying on this feature. Our team continues to add newer features including this capability.